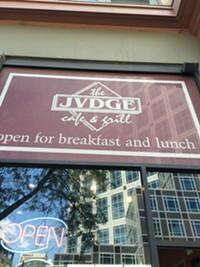 The Judge (Roman Jvdge) Cafe and Grill is a bustling neighborhood eatery in Salt Lake's downtown district, owned by longtime restaurateur Royal Tyler. This Salt Lake City restaurant features a diverse menu of carefully prepared classics and just enough unexpected twists to keep the meal -- and the dining experience -- interesting. The cafe is a graceful and charming place on the ground floor of the vintage Jvdge Building on Broadway. The historic building was built in 1906 by Mary Judge. Daily specials include great sandwiches, Mandarin chicken salad, grill salmon with orange-rosemary sauce, a French dip panini, chicken parmesan and a buffalo chicken wrap. You be the judge.